HomeBatteryElectricityEnvironmentGadgetsHighTechSmartphonesSolar energyFinally, A Radical Innovation of Battery-Free Smartphone That Uses Wi-Fi Signal and Light! Finally, A Radical Innovation of Battery-Free Smartphone That Uses Wi-Fi Signal and Light! In recent years, the researchers’ main focus was to reduce the size of a Smartphone by improving the battery technologies, to get more compact and long-lasting battery life. Now, you will surprise to know the latest development from the Indian-origin US researchers. 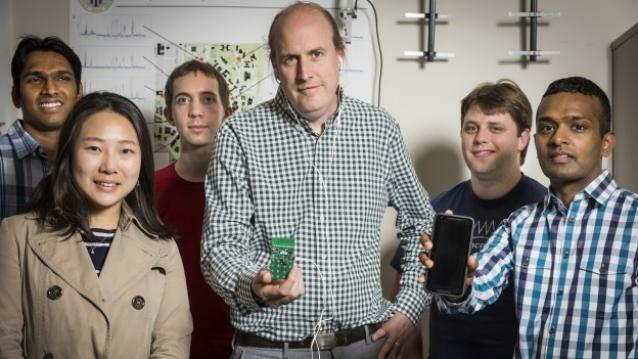 They have invented a battery-free mobile phone which can make and receive calls using only a few microwatts of power from Wi-Fi signals and light! The new phone eliminates the power-hungry step, in most modern cellular transmissions – converting analog signals which convey sound into digital data that a phone can understand. “We have built what we believe is the first functioning mobile phone that consumes almost zero power. To achieve the reality, really low power consumption that you need to run a phone by harvesting energy from the environment, we had to fundamentally rethink how these devices are designed,” said Professor Shyam Gollakota, a member of the research team at the University of Washington (UW). In order to transmit speech, it uses vibrations from the device’s microphone to encode speech patterns in the reflected signals and for receiving the speech, it converts encoded radio signals into sound vibrations that are picked up by the phone’s speaker. Using power harvested from ambient light with a tiny solar cell - roughly the size of a grain of rice - the device was able to communicate with a base station that was 50 feet away. The new design can sense speech, actuate the earphones, and switch between uplink and downlink communications, all in real time. “You could imagine in the future that all cell towers or Wi-Fi routers could come with our base station technology embedded in it, and if every house has a Wi-Fi router in it, you could get battery-free cell phone coverage everywhere,” said Vamsi Talla, a research associate at UW. The team has developed a working prototype of a phone using components on a printed circuit board that can do the basic functions such as transmitting speech & data and receiving use input via buttons. They also made Skype calls using its battery-free phone. In a conference paper published earlier this month, Talla, who now serves as chief technology officer of Jeeva Wireless, and his colleagues call their design “a major leap” toward the creation of battery-free devices. Ultimately, they want to build devices that can constantly transmit or receive data and voice call over long distances without batteries. The study was published in the journal Proceedings of the Association for Computing Machinery on Interactive, Mobile, Wearable and Ubiquitous Technologies.